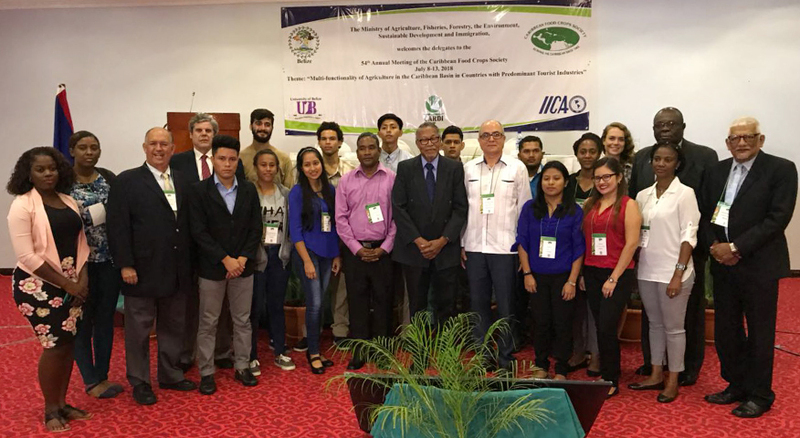 The Caribbean Food Crops Society (CFCS) held its 54th Annual Meeting in Belize at the Ramada Princess Hotel in Belize City during July 8-13, 2018. The meeting was held under the theme “Multi-functionality of Agriculture in the Caribbean Basin in Countries with Predominant Tourist Industries”. The formal inauguration was held on July 9 where key speakers welcomed the participants. Senator Hon. Godwin Hulse, Minister of Agriculture, Forestry, Fisheries, the Environment, Sustainable Development, and Immigration was the first speaker to deliver remarks. He was followed by the Director General of the Inter-American Institute for Cooperation on Agriculture (IICA), Dr. Manuel Otero. Director General of the Caribbean Agriculture Research and Development Institute (CARDI), Mr. Barton Clarke; Professor Emeritus Clement Sankat, and Chair of the CFCS Dr. Wilfredo Colón also welcomed everyone, the vast majority being from the Caribbean (English, French, Spanish and Dutch) countries and the Americas. On the opening day, courtesy of the CFCS and the Ministry, twenty students of the University of Belize were invited to attend. Students from other Caribbean countries, were also present. The Central Farm Campus also welcomed the delegation from the Caribbean and the Americas on Friday to the Campus at Cayo, where they learnt of the work UB is doing in agricultural education and toured the farm facilities, which were described as a “living laboratory for agriculture”. President Sankat was also invited to address the Opening of CACHE’s Annual General Assembly on July 10, 2018 at the Ramada Princess Hotel, Belize City. President’s address focused on “Agriculture, and the Undergraduate education offered at UB.” His address is available at https://www.ub.edu.bz/download/presidents-remarks-at-xxi-agm-of-caribbean-council-of-higher-education-in-agriculture/.